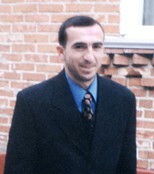 Yandiev Magomed Muradovich, 1972. kidnapped in March, 27, 2006. Magomed Yandiev lives in Suburb of Kartsa settlement in the Kartsinsky street the house № 46. On March, 27th, 2006, at 15 o’clock in the afternoon, Magomed went to the Vladikavkaz town. There are witnesses who assert that saw Magomed at the road service station № 2 of Vladikavkaz town . At 16 o’clock 30 minutes he phoned to his relatives and said he was detained in a check station. The fate and whereabouts of the subject remain unknown.. Distinctive feature of Magomed Yandiev: stature 170 sm, a thin build, dark blond hair , eyes brown. A little and anonymous fingers on the left hand accreted. Has been dressed in brown sheepskin coat, black velveteen trousers, a light sweater, boots of black colour, a black velveteen cap.